The Cultural Capital of the Riviera Nayarit invites everyone to view Cuaderno de artista by Rodrigo Ballester, on display at Bodega 3. 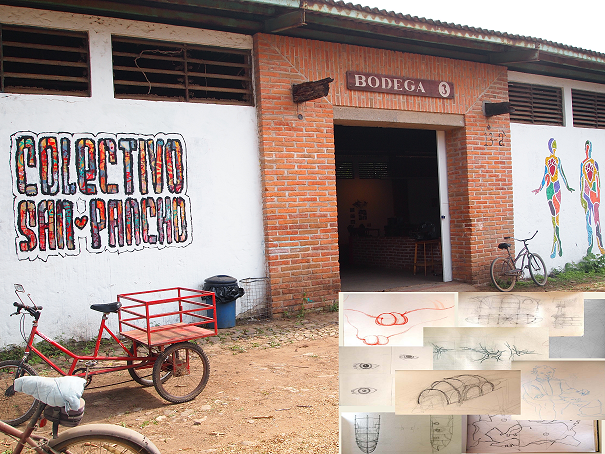 In step with its title of Cultural Capital of the Riviera Nayarit, San Pancho is extending an invitation to view a new art exhibit to be displayed at Bodega 3, an exhibition space that recently opened its doors to presentations by artists not belonging to the San Pancho Collective. The current expo is titled Cuaderno de artista: Guorquin proces, created by self-taught plastic artist, Rodrigo Ballester, originally from Xalapa, Veracruz. The inauguration of this particular gallery will be on April 30th at 8 p.m., a date that falls on Mexico’s celebration of Children’s Day. The artwork produced by Ballester will occupy the entire Bodega 3 gallery floor in order to fully display his splendid pieces. “These journals compile a part of the intimate life and day-to-day thoughts of someone who tries to create a life from everything he knows how to do and does it in a conscious manner. An installation of bamboo, a bamboo treatment machine, a metallic mural, monotypes, a video and a serious of random objects emerge from the notes and materialize, little by little, until they become the exhibit itself,” concludes the description. The first exhibit recently held in this cultural/artistic space was a success; with this second expo San Pancho continues to expand its frontiers through art. The unique way the Cultural Capital of the Riviera Nayarit presents itself to tourists with cultural pursuits is commendable. Presentations like these work in sync to continue to position Mexico’s Pacific Treasure with this particular segment of visitors. The town also maintains its commitment to bring culture to the local population, helping to raise awareness through its art of the different ways to benefit the region.